This wall picture Hand-painted painting "Frozen Lights" 180x80cm is a hand painted, not an art print. 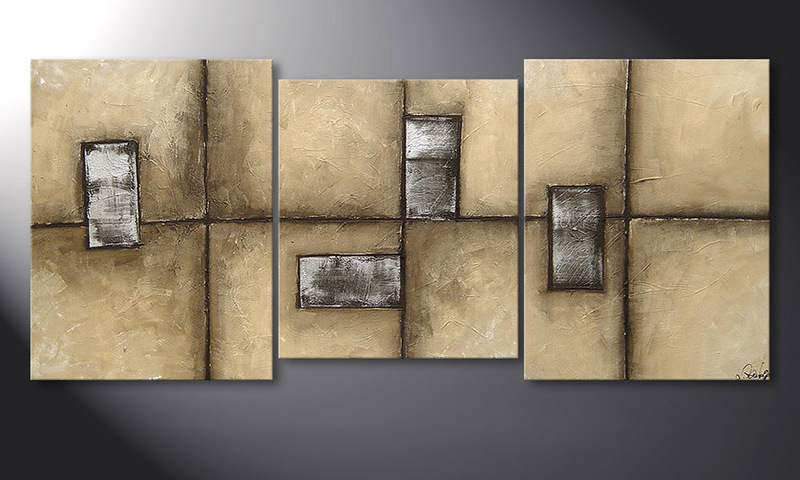 It consists of 3 panels with a width of 180 cm (without spaces). Beige, Silver are the main colours of this picture. The Potsdam based artist Luise Zantopp is a co-founder and one of the heads of Paintings XXL. Antje Rose (her original name) respectfully continues using her great grandmother's name and thereby pays homage to her ancestor. Luise convinces with an adventourous, diversified, and colourful approach to painting. She utilizes a wide variety of painting techniques she has acquired over the course of time through her eagerness to experiment and through hard exercise. Her big stength is having an eye for every small detail with which she refines all of her paintings to the point of perfection. Her natural and city motives are highly distinguished and have become very popular products. The painting is stretched on a wooden frame and its sides are painted. Consequently, no additional frame is required. The painting is ready to hang. We only use high-quality acrylic paints with a subsequent layer of varnish to seal and protect the painting from dust, scratches, humidity, and UV radiation.